Chicago's Lincoln Square neighborhood consists of the area bordered by Foster Avenue to Montrose Avenue, Damen Avenue to the Chicago River. It's easy to access our great businesses by the CTA Brown Line, multiple CTA bus lines or by the Metra Union Pacific North line. 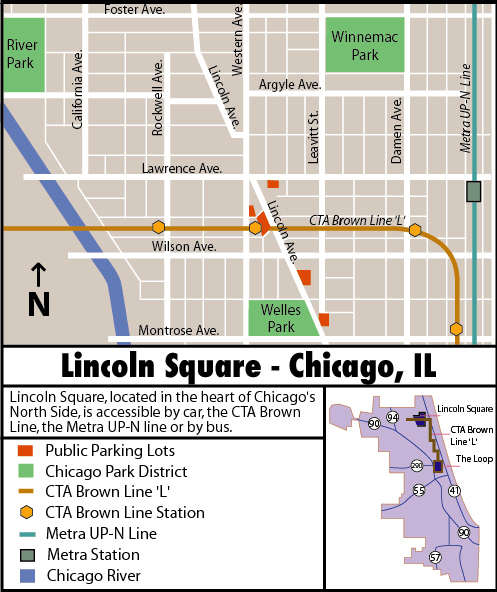 Lincoln Square also offers metered street parking throughout its commercial districts, in addition to several public parking lots. Ample parks, bike lanes and public squares make our neighborhood friendly to both pedestrians and bicyclists, too.